Rancho Santa Fe is unlike any other Cotacachi Hotel. It was built from scratch four years ago to be a corporate stay hotel set in spacious gardens. The owner is Don Hugo Cordova, the former owner of Meson de las Flores; in fact he sold Meson de las Flores to Gary and Merri Scott to finance his new project. Don Cordova also owns several businesses in nearby Ibarra and also served as governor of Imbabura province some years ago. As Cotacachi hotels go, Rancho Santa Fe is certainly an ambitious project, Don Hugo and his wife invested more than $3 million into the project. I believe Don Hugo was nearly 80 years old when he started this project so at his age he was not deterred by a mere $3 million project! 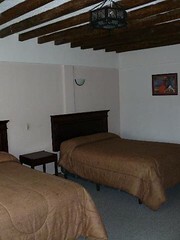 The hotel lies just on the edge of Cotacachi, 6 blocks from the center, on Avenida 10 de Agosto. The hotel is split into communal areas and another section for the rooms. The entrance is impressive. … and is made up of the central reception area where there are couches to sit and relax and also a huge 200 person meeting room and a dining room for a similar number. The central hallways leads out to the rooms at the back facing onto a central lawn. 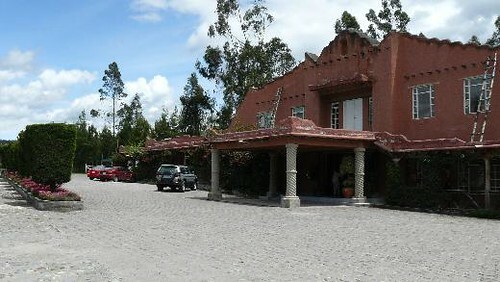 One night at this Cotacachi hotel costs $59 plus the normal 22% tax for a room with a bathroom. 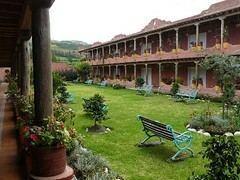 Meanwhile when Meson de las Flores is full this is a good alternative Cotacachi Hotel for our guests. 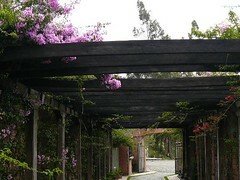 Perhaps the most attractive part of Rancho Santa Fe for me is the landscaped gardens leading to a small swimming pool, a tennis court and a soccer pitch where, by the way, the Meson de las Flores soccer team triumphed against the Rancho Santa Fe team in the annual Cotacachi hotels tournament! We have had some indication from Don Hugo that he now wants to sell Rancho Santa Fe. The corporate business is maybe not all that he would have hoped for when he began this project. 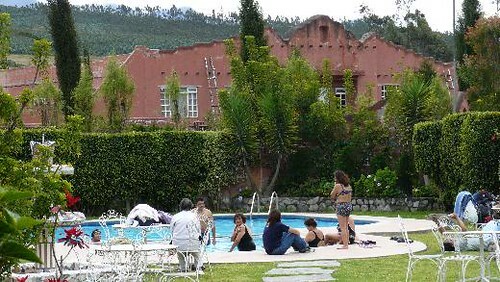 Meanwhile Rancho Santa Fe is a Cotacachi hotel you can enjoy especially if you have children travelling along with you.